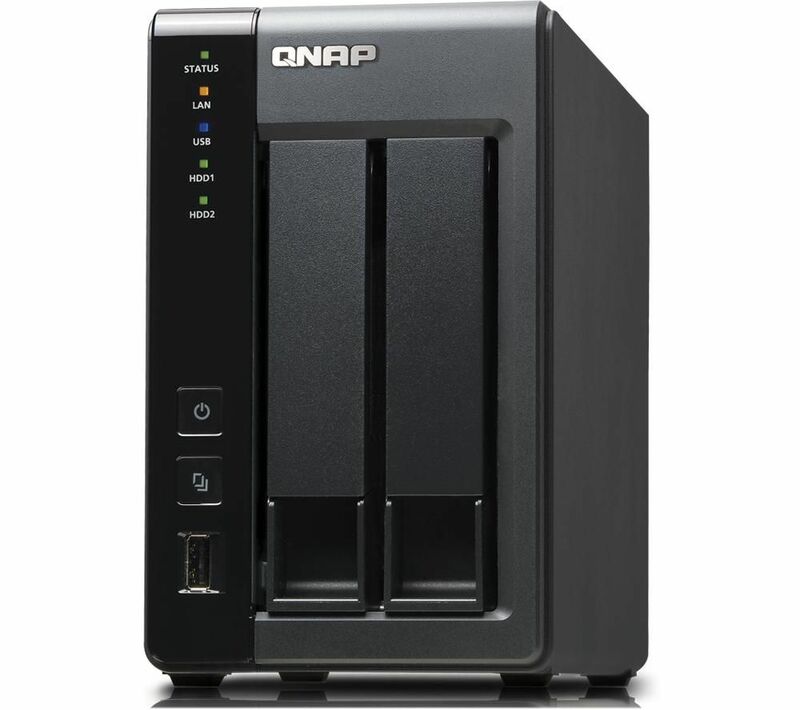 QNAP has a few decent NAS boxes for business and home use and the TS-219P II is no exception. This particular model comes in at around £290 and sports a 2GHz Marvel Kirkwood processor as well as 512MB of DDR3 memory. The unit is not supplied with hard drives by you can fit you own with a maximum capacity of 3TB. The two bays are hot-swappable and on the rear is a 70mm colling fan. The unit itself feels quite sturdy and has large rubber feet for greater stability and quietness. It sports two eSATA ports, 2.5in hard disk support, online RAID capacity expansion and level migration and Wake on LAN. However, USB3 is not on the NAS box – there are three USB 2 ports instead, which all support USB mass storage devices and memory card readers as well as compatible WiFi adapters. There is a one-touch backup button so you can download data onto a flash drive or another disk. Setting up is a cinch. We got it up and working in about 15 minutes using the QNAP finder. Once into the interface we downloaded and installed the latest firmware (in fact during the test there were a few firmware updates required). As you install you can enable various features on the box that makes it so much more than something to store photos on. We were able to enable UPnP server, BitTorrent-equipped Download Station and iTunes server. It does bill itself as Time Machine compatible, however we were never able to get this to function properly. We suspect that Apple may have changed the protocol for this rendering any connection to the box impossible, but the real reason remains unclear as to why. The user interface is good but not that pretty. Still it is better than a lot of other NAS devices on the market so no real complaint. A column on the left of the main interface displays the main tabs, such as System Admin and Disk Management, while QNAP’s media hub – Multimedia Station – and Download Station – are found as large coloured icons at the top of the page. The application server options are numerous and include UPnP/DLNA media server, web server, Web File Manager, Multimedia Station, Photo Station, Music Station and Download Station. This option schedules BitTorrent downloads. The Multimedia Station allows sharing media files over the web, but it’s not the easiest application to use. The NAS device allows third-party plugins available (called QPKGs) to be installed, including a WordPress blog server or Joomla CMS as well as third party DNLA servers. There are some advanced admin and network features, such as creating users and groups and integration into an Active Directory domain, while these are good options for a small business or corporate network they may fox the home user. It also boasts a free MyCloudNAS remote access feature which enables users to access files when they are not at home. It can also back up to the cloud via services such as Amazon S3, ElephantDrive and Symform. There is also iSCSI support, which permits PCs to access a NAS volume just like a local hard disk, rather than using shared network folders. The device worked very well in its normal NAS functions but the processor struggles sometimes to perform some the third party packages adequately. However, there are enough options and features to keep everyone happy. Previous articleWin a PCTV nanoStick Solo to watch, record & rewind live TV anywhere!